Kanorado, Kansas–J.H. Tillotson, Contractor, of Denver, built this elevator. Here’s a view of the south side. Note the windows near the top. J.H. Tillotson and Mayer-Osborn built the no-headhouse elevators with different window arrangements. This view shows the elevator, the office building and feed mill. I do not have a date for when it was built. 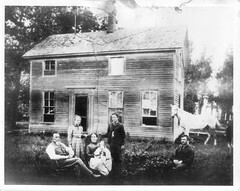 The office and feed mill were built at the same time. 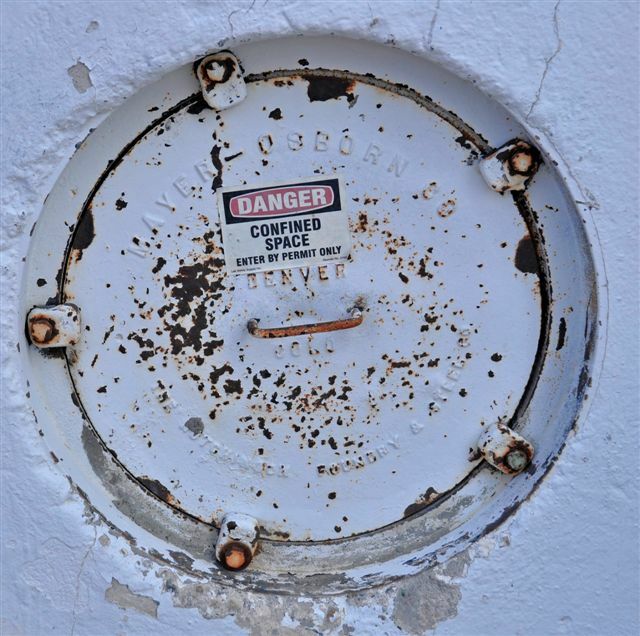 This is a manhole cover inside the elevator. 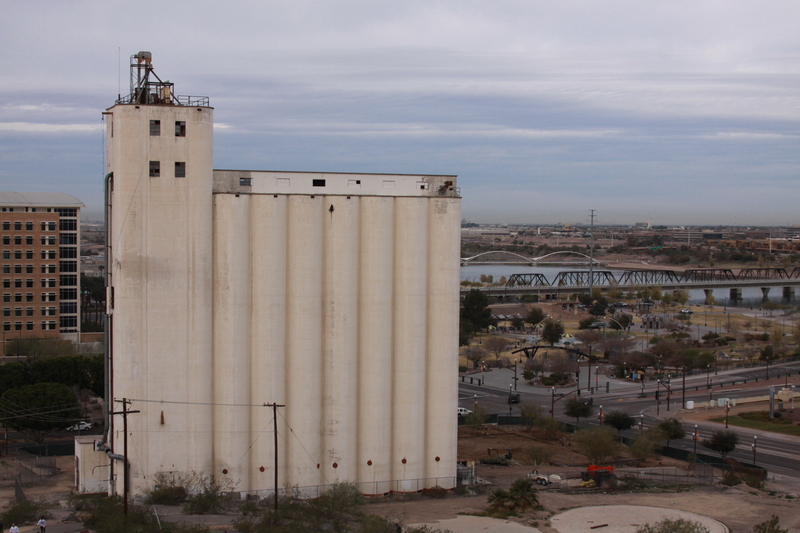 Tempe, Ariz.–Ensconced amid sleek office buildings on South Mill Avenue here, the Hayden Flour Mill represents the very origin of this city now best known as the home of Arizona State University. Charles Trumbull Hayden’s mill was built of adobe in 1874, burned in 1917, and rebuilt in concrete in the following year. In 1951, Mayer-Osborn constructed the elevator beside it, looking up to Hayden Butte, which is famous as the freeloader’s vantage point for watching football games in Sun Devil Stadium to the east. 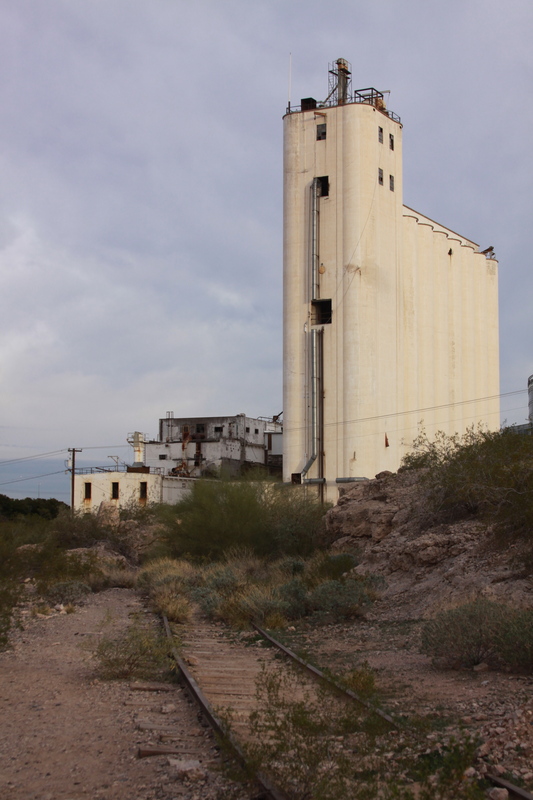 The mill and elevator fell into disuse in the 1980s. A plan announced in 2011 (with implementation already overdue) calls for the mill building to get a coat of paint and a lawn as the first step in a redevelopment effort. The elevator could use some new glass while they’re at it. 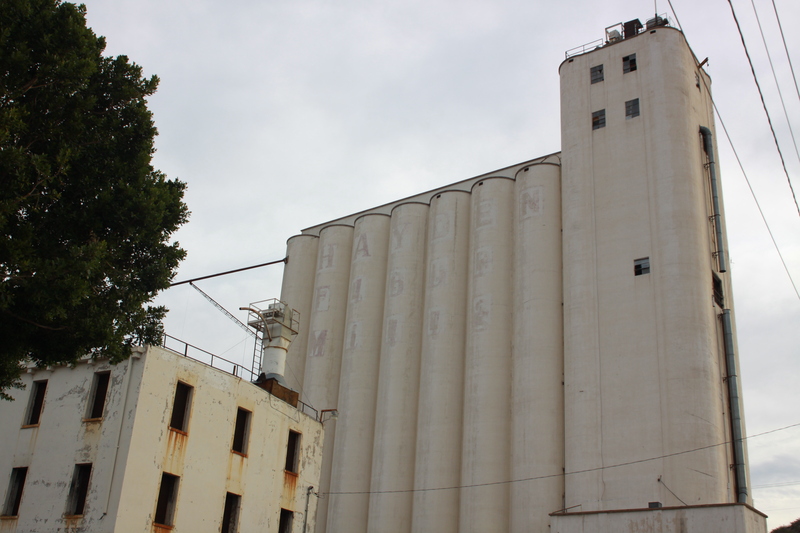 And wouldn’t it be interesting if the lettering on the west side of the seven silos were restored? I was in Scottsdale last weekend for the Barrett-Jackson auction and made a run down to Tempe on Saturday morning. It was impossible to make out the second name in faded paint on that west side. Is it Hayden Elbup Mills? At any rate, this is a handsome elevator. With a little thought–designers, awaken!–it could be an interesting complement to the surroundings. Burley, Idaho, January 18—I spoke to Leland Ulrich, manager here for the past seventeen years, and learned some particulars about this town’s Mayer-Osborn elevator. Mr. Ulrich replaced the old manager, Ivan, long since passed, who apparently had the building’s plans and pictures and history. That investigation is for another visit, since their whereabouts is unknown. Mr. Ulrich took me for a short tour. I had to put on a hardhat to go inside. The vertical, rectilinear part of the building houses the headhouse way on top, with a “run” protected by a tin roof that went out from it to all of the round bins. The tin roof was a bit of an oddity, he said, but it was original. Most are concrete. 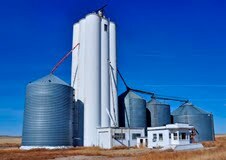 The elevator was designed for seed, both barley and wheat, for farm planting. Formerly a wood and metal elevator was beside it, but it burned in the late-1950s. 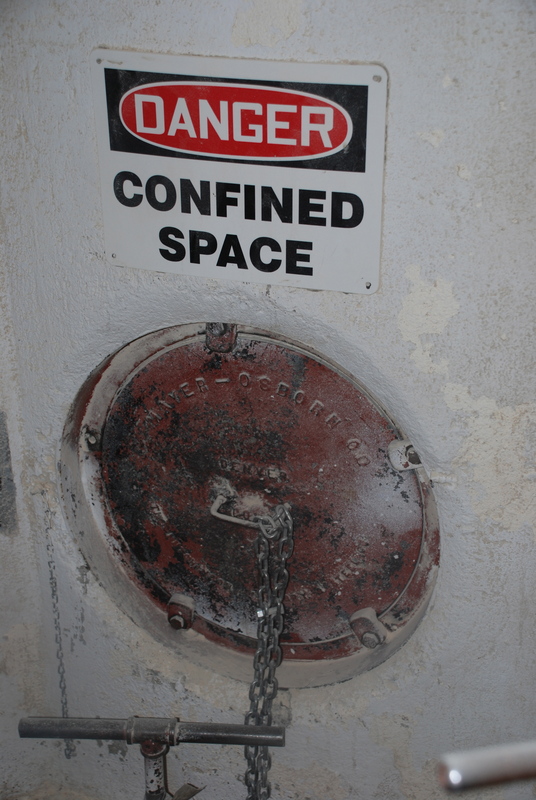 Some of the big metal parts in the new building might have been that old, salvaged, but there was no way to be sure. But the elevator built by Mayer-Osborn was all original. The number one bin, closest to the part that houses the head house and the man lift, was empty and I could look inside, but it was too dark to see anything. The bins have sloped floors at a pretty good angle so the last of the seed could be emptied down below, in the “pit.” Whether it was carried out of there by conveyor or some other means is something I missed. The “leg,” he said, in the bin adjacent to the number one bin, went all the way to within eight inches of the top, to facilitate proper distribution between the bins. I did ask Mr. Ulrich what the ports are used for, and it is for access—so someone could get into the bins. So “manhole covers” it is. The port cover that was removed on the number one bin, which I’d peeked into, was only identified as Hutchinson foundry steel. But there were Mayer-Osborn ports inside and out, painted and unpainted. It’s a big elevator—much bigger than anything I’ve seen of theirs before, perhaps even as big or bigger than Tempe, Arizona. Mr. Ulrich remembered another visitor who took pictures about ten years ago and sent him some prints. He thought Gary’s name sounded familiar, especially when I mentioned he worked for the railroad. 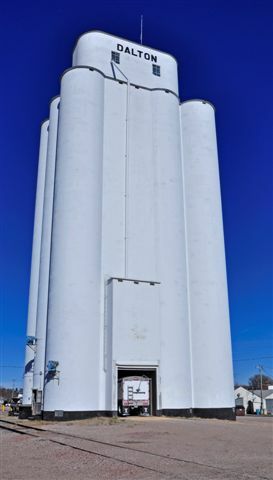 There is an old citizen in town named Lou Dilley, whose father, known as Pop, built the older flour-mill elevator. Mr. Dilley is said to be in his eighties and loves to tell about the history of the town. He apparently worked on his dad’s construction jobs. So if I can get back, he would be the one to see. 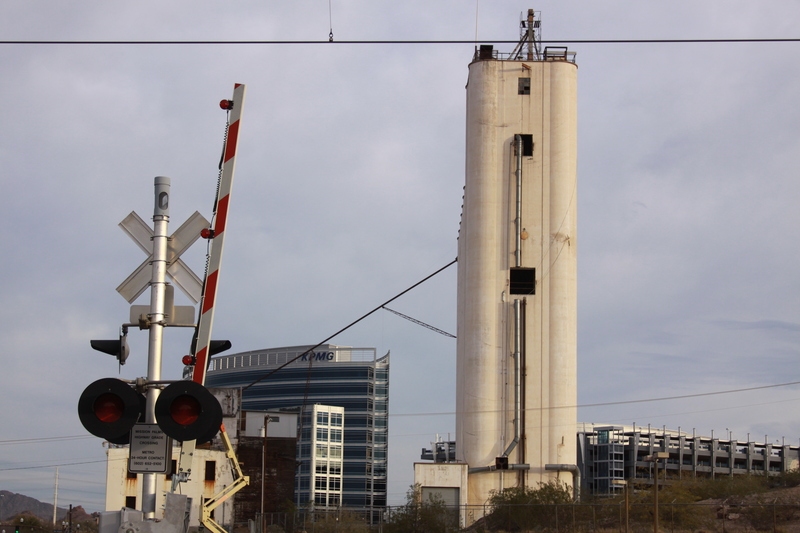 Eash of the 23 tanks is 135 feet tall and is made from six inches of reinforced concrete. The head house is 165 feet high, equivalent to a 16-story building. 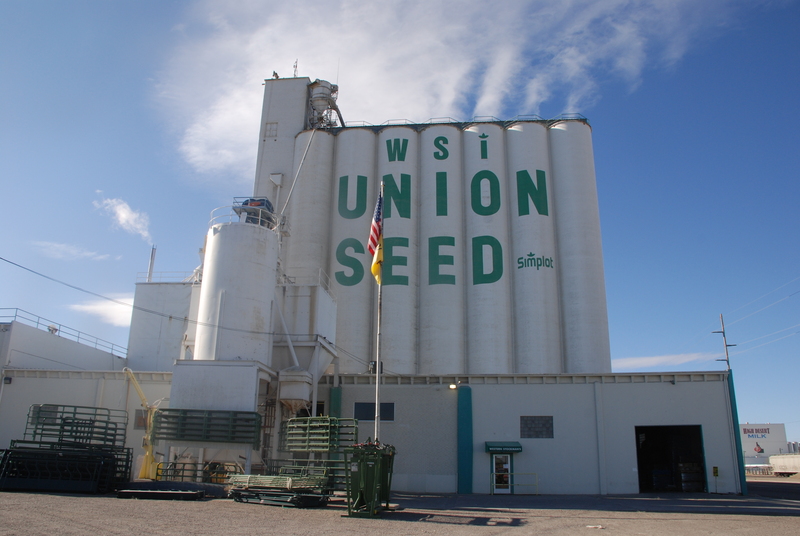 The tanks will be used to handle individual and Union Seed storage needs. 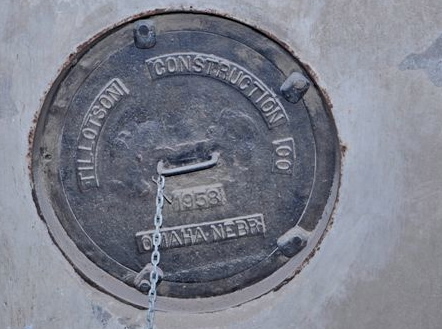 Barnes said that about 20,000 sacks of cement had been used in the construction under contract by Mayer-Osborn Construction company, Denver. He said the latest grain cleaning machinery has been installed, along with scales large enough to weigh the largest trucks, and that there are conveyer belts in both the head gallery and the basement tunnel. Tillotson Construction’s elevators were unique, with some features that I have not seen from other elevator builders. One major feature was the curved head house. I have only seen one other company that produced an elevator with the curved headhouse. Another feature was that Tillotson put windows for light into the basement. Of course they had electric lights in the basement. I have not seen another builder put windows in the bottom part of the elevator. This must be a Tillotson trademark. This elevator has the year of construction added to the manhole covers. It shows 1958. Tillotson did a great thing by adding this. 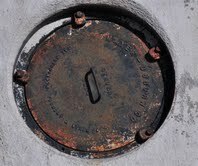 All the elevators that I have been inside, I have not seen another company put the year on the manhole covers. 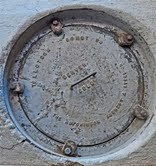 The date was on each manhole cover inside the elevator.